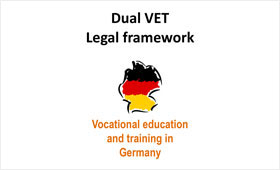 The presentation on legal framework of VET in Germany is available in several languages, respectively in pdf and PowerPoint format. The presentations are subject to copyright owned by GOVET. The presentation or individual segments may only be used under the condition of naming the author GOVET. How many hours a week can a trainee work? Does the minimum wage apply to the apprenticeship? And who controls the work of training companies and vocational schools? From Basic Law to Land Law: VET in Germany is framed by a large number of legal regulations. The presentation is divided into seven chapters and explains the rights and duties concerning VET in Germany. The attached graphics illustrate the complexity of the subject.